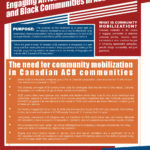 The Canadian HIV/AIDS Black, African, Caribbean Network (CHABAC) is pleased to announce the release of two new fact sheets focused on the HIV engagement cascade! 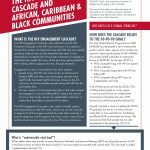 INFO SHEET #1: The HIV Engagement Cascade and African, Caribbean & Black Communities This is the first of two fact sheets focused on the HIV Engagement Cascade. 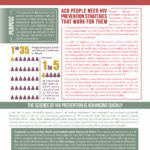 The purpose of this fact sheet is to provide an introduction to the Cascade and its components, how it relates to the UNAIDS 90-90-90 Goal, and some key principles in addressing the gaps in the Cascade.